Stand a chance to win a Shell Fuel Voucher! Entries for the Competition will open at 17h00 on Thursday, 1 December 2016 and will close at 18h00 on Thursday, 1 December 2016 (Competition Period). 2.1. Entries for the Competition will open at 17h00 on Thursday, 1 December 2016 and will close at 18h00 on Thursday, 1 December 2016 (Competition Period). 6.1. 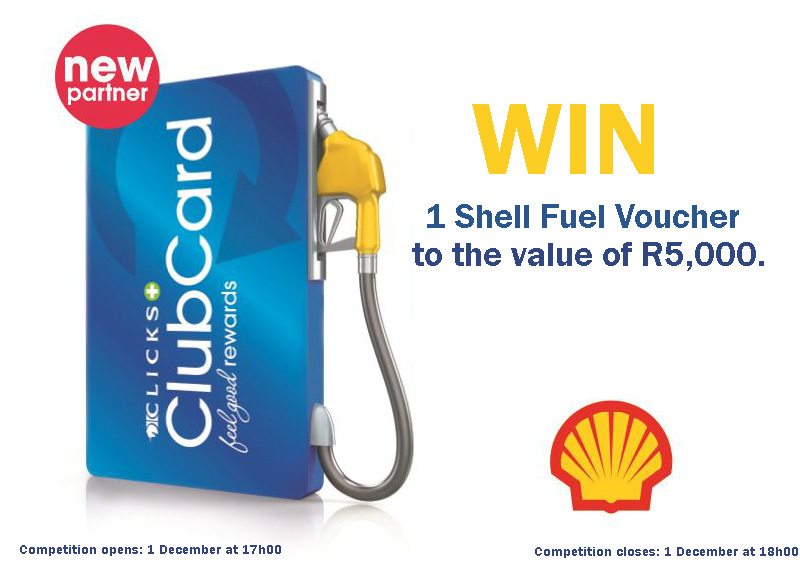 The Winner will receive a Shell fuel gift card (Gift Card) to the value of R 5 000.00 only (five thousand rand) (Prize) courtesy of Clicks ClubCard. 6.2. The Gift Card may be presented as payment for purchases only at participating Shell petrol stations and use of the voucher shall be subject to standard terms and conditions for such gift cards. 6.3. The gift card may only be use for petroleum purchases and not for store items. 6.4. Petrol purchases can be made using the Gift Card until the value reaches zero. The Gift Card cannot be reloaded. 6.5. The value in the Gift Card is only exchangeable for purchases at selected Shell stations and may not be refunded or redeemed for cash. No cash will be given. 6.6. The Gift Card is valid until the date on which the full value has been redeemed or 36 (thirty six) months from date of issue. Any value remaining on the Gift Card at that date will be forfeited. 6.7. The Prize excludes all items not mentioned in clause 6.1. 6.8. We will contact the Winner per telephone to make arrangements for delivery of the Prize, which shall be delivered to the Winner within 30 (thirty) days from confirming the Winner. 6.9. The Prize, or any part thereof, may not be exchanged for cash any other item. Prizes are not transferable. We reserve the right to substitute the Prize, or part thereof, with any other prize of a similar commercial value.